After taking a closer look you’ll realize the seven colors are very real. But this unusual coloring of the hills at Chamarel isn’t their only bizarre trait. 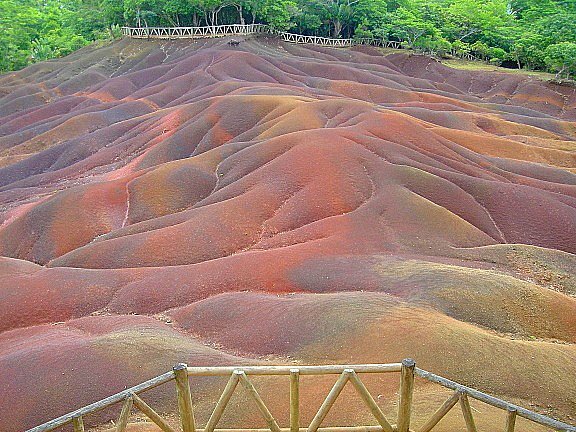 The coloured earths of Chamarel were promoted as Mauritius' first tourist attraction back in the 1960s. Even today souvenir test-tubes containing the multi-coloured earth can be bought from beach vendors and tourist boutiques, or from the yellow-roofed administration building at the entrance to the site. The land belongs to the Bel Ombre Sugar Estate and a small entrance charge is made to visit. An example of the horizontal mill, like a giant's washing mangle, lies in front of the administration building. It was introduced by Charles Telfair, one of Bel Ombre's first owners.